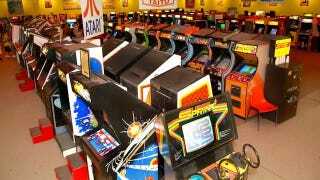 Those of us that remember them still miss the arcade emporiums of yore, even is they reeked of cigarette smoke and too much body odor in too small a space. That era's long gone but the American Classic Arcade Museum, located in New Hampshire's Funspot arcade, remains one place where folks can lay hands on the glorious stand-up coin-operated machines of the past. Yet, as substantial as ACAM's collection is, the institution doesn't have every stand-up arcade game ever made. When private collectors unload their stock of old-school cabinets, there's a chance for the museum to beef up their inventory. One such opportunity's happening right now, with back-in-the-day games Space Dungeon, Mad Planets, Solar Fox, Discs of Tron and Black Widow being offered to sale for ACAM. However, the museum's a on-profit organization is coming up just short of half of the $3,650 asking price. So, they're turning to gamers and old-school arcade enthusiasts to make up the difference. If you want to help those dusty quarter-munchers find a good home, you can visit the ACAM homepage and make a donation via the ChipIn widget found there. Who knows, if you're ever in New Hampshire, you can drop by FunSpot and the American Classic Arcade Museum and say hello to some old friends.